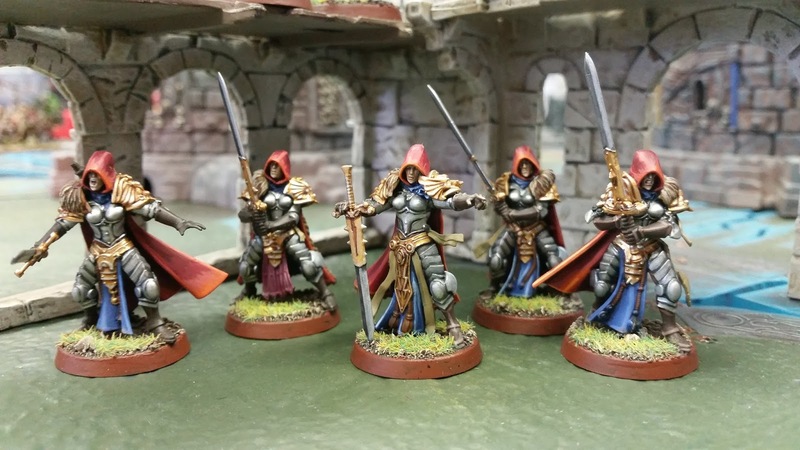 Today I have a special guest article by hobbyist extraordinaire Martin Orlando. You may have seen pictures of his army already on several of the Facebook groups. Here he has gathered together a bunch of those pictures as well as going over his thoughts behind making the army. 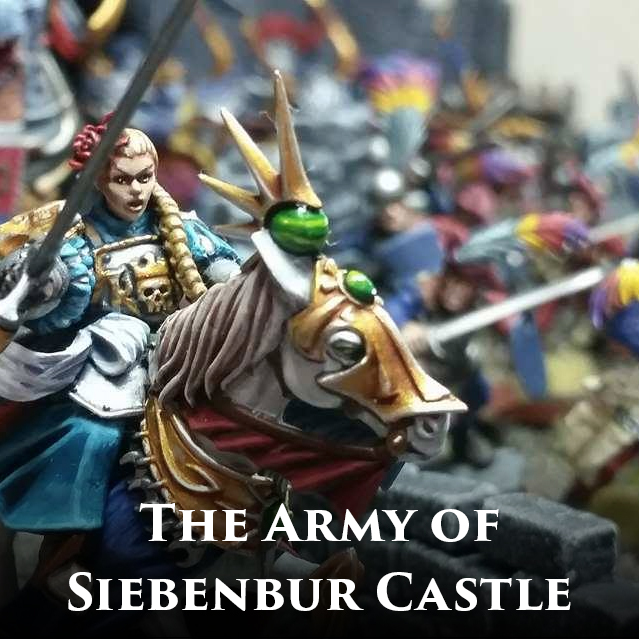 So without further ado, here is Martin to tell us about The Army of Siebenbur Castle. Martin: First, I would like to thank Mengel Miniatures for providing me with the opportunity to speak and share my work on such a prodigious platform, and to offer my congratulations in regards to the completion of your Tomb Kings Battletome, and your much-deserved award at Adepticon. 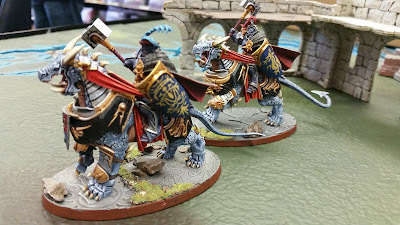 Hello readers, my name is Martin Orlando, I am the kitbasher-in-chief, a Warhammer: Age of Sigmar gamer, and painter residing in the hinterlands of southern New Jersey, USA. 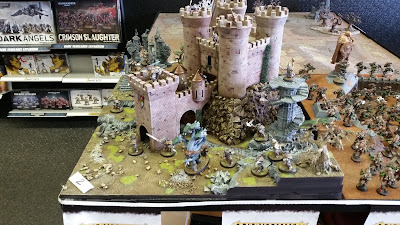 Some of you may have heard of me or seen my work, for I have traveled from Warhammer World to Adepticon, Holy Wars, Las Vegas and back again in search of fun games and painting competition. Age of Sigmar struggled to catch on in my local community at first, so I decided to compete far and wide where the game was more popular. Thankfully, the NJ Sigmar scene has since improved, but that won't stop me from trying to play games of Warhammer in every time zone! I am a student of the brush and a wargamer in equal measure. I haven't been able to compete in a Golden Demon since 2012, but I made a decision some time after the fact, that competing with a single miniature wouldn't satisfy me in the end. I prefer to paint an entire army to the highest possible standard I can muster. I also like the idea that I get to continue using them as gaming pieces, as I am not content to paint miniatures destined for a display cabinet only. Many of my projects are tremendous undertakings requiring artistic research, planning, and always a dragon's hoard of bitz! My latest creations have challenged me more than ever, as seen here. 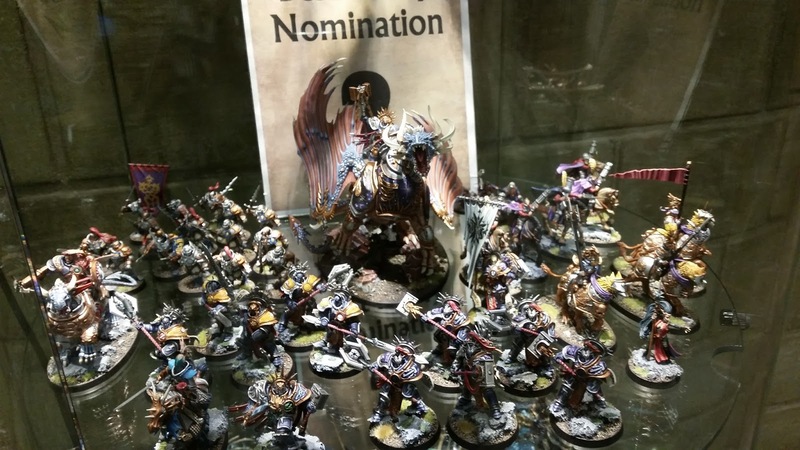 I was astounded to receive a Best Army nomination at both Adepticon and Las Vegas Open 2017, where I faced stiff competition the likes I have seen nowhere else. My conversions and color schemes have generally been influenced by Japanese video games that depict a western fantasy or medieval setting. The lens through which one culture examines another has created such unique creations including Dark Souls, the Tales franchise, Dragon's Dogma, Final Fantasy, and more. Some of these titles have art books which depict concept art, color patterns for factions and armor sets, and banners. For my Grand Alliance: Order army, I gave myself the task of creating a force that personifies the tropes of these games whose art style is so captivating to me. Their narrative was one I named the Army of Siebenbur Castle; an epic city-state in Ulgu ruled by an exiled noblewoman (pictured above) who brought together all these outcast and disenfranchised people from across the mortal realms and convinced them to form a society under her rule. While they have disparate origins, they willingly wear similar colors or types of armor - as they live as equals in one fiefdom - in a realm blighted by dreadful illusions and baleful fog. 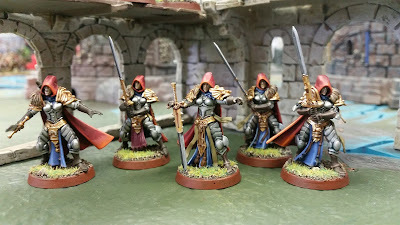 In my most recent army list, no unit repeats twice, and five factions are represented within it (Stormcast, Bretonnia, Darkling Covens, Freeguild, and Ironweld Arsenal), meaning that I needed to create at least the idea of a unified color scheme between them. If I didn't, there would be no aesthetic cohesion in the army, which doesn't fit the narrative I gave the army list. 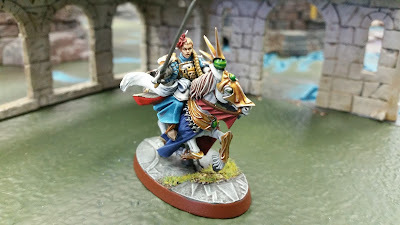 Chinese inspired Stormcast! Well, somewhat. I haven't painted a canon color scheme since I was in high school raving about Black Templars Space Marines. 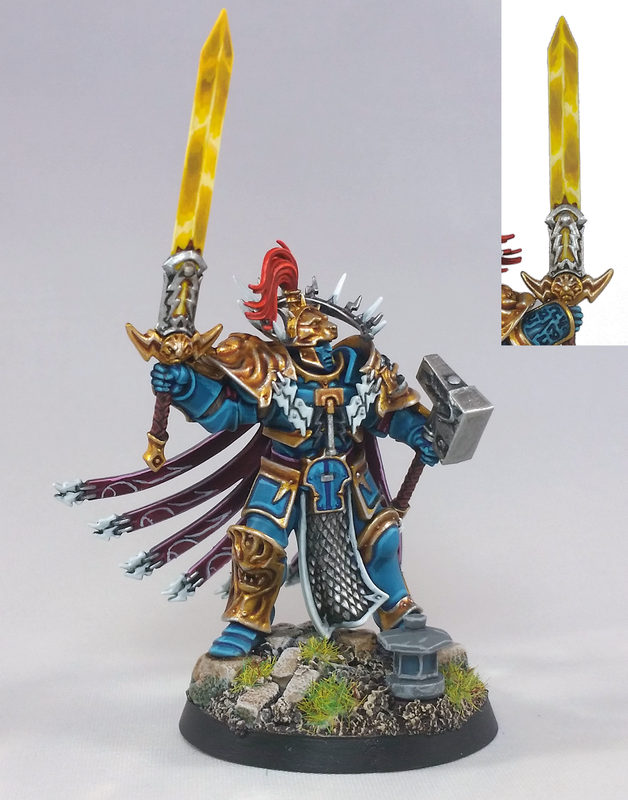 I was inspired to paint the Celestial Vindicators after reading what little there is about their lore, and coming to some revelations about color theory in regards to large events. Without exception, I find a way to add my own unique flavor to whatever faction I collect. I decided to transpose onto the Stormcast Eternals a flavor of the far east, something not often seen in Warhammer lore. How I go about merging these almost polar opposite aesthetics will be revealed in time. I plan to have the army completed by the end of the year, so I may compete with it at Warhammer World and Adepticon in early 2018. 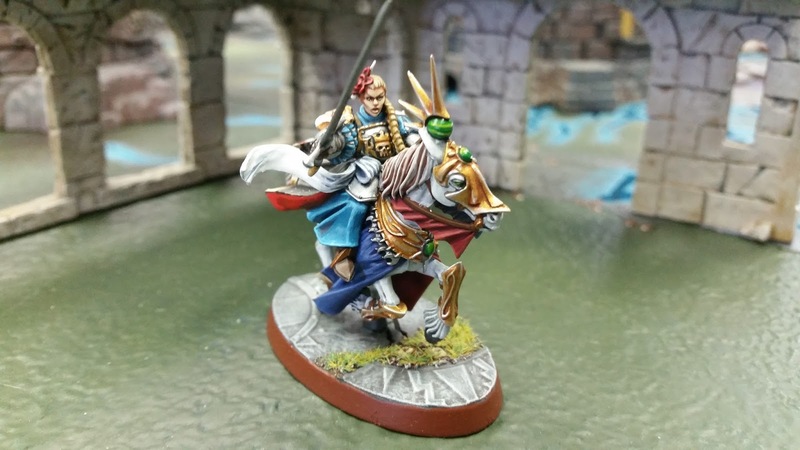 I have reached out to several talented painters at events and through continued discussions on social media on improving how I paint my Stormcast, and I can say with absolute certainty their council has helped to improve my painting ability. I want this army to be my best to date, one perhaps worthy of the pages of White Dwarf magazine! I'm already hard at work on it. The bases for the stormcast are a task in their own right, as each is covered with bricks I lay down by hand. Almost 2,000 bricks will be used by the time the army is finished! Thank you again for this opportunity Tyler! And to all of you fair hobbyists reading this article, I may just see you at the next Age of Sigmar you attend. One never knows where in the world I might appear. Tyler: Thank you to Martin for taking the time to come on here and share his amazing army! I look forward to seeing his future models for his army. 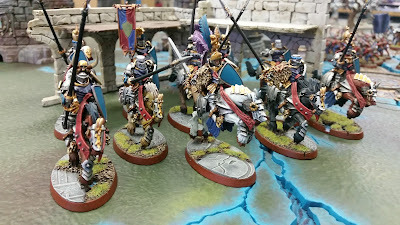 I was lucky enough to see his existing army in person at Adepticon and it's truly awesome looking.